“All pump piping, valves and valve controls, fire hose connection, caps, chains, and gaskets shall be inspected for security of mounting, structural integrity, deformation, and free from leakage and lubricated as required by the component manufacturer.” -National Fire Protection Association 1911, Standard for the Inspection, Maintenance, Testing and Retirement of In-Service Automotive Fire Apparatus (2012). If I were to read this to the firefighters in my company, I might as well be speaking a different language. Yet, this is how some of our industry standards are written. We must follow them for guidance on basic maintenance to keep our equipment safe. Below is a simple drill that you can do in your station to help your members understand fire pumps and pump panel instrumentation to ensure your apparatus is always ready to go. First, establish a positive water supply and open all discharge valves. Allow water to flow through with your rig in nonpump mode. Backflush for at least five minutes before shutting the hydrant down. Repeat this step with all discharge gates closed halfway. This allows water to flush both sides of the ball valve and remove any debris stuck in the valve seals. After completing this step, close all discharge valves and open all intake caps, which will backflush the lower pump body. This is a quick way of identifying overlooked problems originating from stuck or damaged ball gate valves. As an additional benefit, this procedure completely flushes stones and sand that accumulate in pump bodies. When the pump body has no water, it’s a great opportunity to perform a dry vacuum test to see how well the pump is sealed. A trick of the trade to identify a leaky discharge valve is to remove all discharge caps and place latex gloves over the outlets before pulling a prime. The industry standard is to achieve 22 inches in 10 seconds, and it should not drop below 10 inches in less than five minutes. 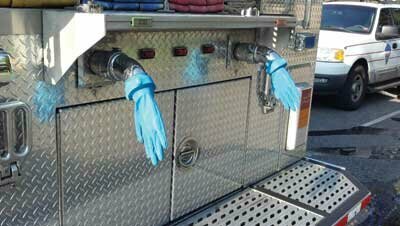 You can easily identify a drop in pressure when a glove is being pulled into a discharge. Open the tank-to-pump valve (thus filling the pump), discharge the tank water, and refill the tank. 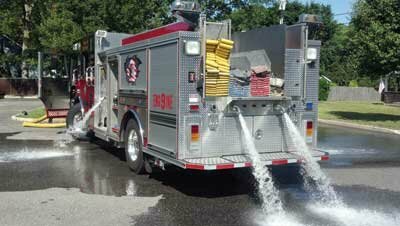 This accomplishes two key operations: It removes old stagnant water from the apparatus (manufacturers recommend doing this monthly), and it allows you to check the tank-to-pump valve function. Additionally, this will backflush the seals in the ball gate valve assembly. With the pump in gear at idle, open all discharge drains and allow them to flush for two to three minutes. Next, take the pump out of gear and open all intake drains, which will allow the hydrant pressure to backflush the intake drains. Conduct this procedure for two to three minutes. So, in just a short time, you have just tested all your discharge and intake valves, the tank-to-pump valve, the vacuum gauge, and the discharge and intake drains for proper operation. You have also tested your pump shift and interlock system without even thinking about it. Additionally, your firefighters have benefited from a hydrant drill. These steps are easy and often overlooked, but I guarantee that the more you use this simple technique, the fewer problems you will see on the fireground and the more comfortable your firefighters will be around their apparatus at the next working fire. DANIEL PELUSO is a 27-year veteran of the volunteer fire service on Long Island, New York. He has more than 30 years of experience as an automotive technician and has serviced fire apparatus for the past 10 years. He holds Emergency Vehicle Technician (EVT Certification Commission), Automotive Service Excellence (National Institute for ASE), and Factory Mutual training certifications. He is the vice president of the Long Island Emergency Vehicle Technician group and has taught fleet maintenance for the past several years.